Manipur Proletariat People’s democratic Union (MPPDU) today observe the Great Bolshevics October revolution of 1917 which successfully built the first socialists country called the Union of Soviet Socialist Republic (USSR) under the leadership of Vladimir Ilyich Ulanov, popularly known as Lenin. On the occasion courageous personalities in various field including New Editor of IMPACT TV Raj Nongthombam, RTI Activist Wahengbam Joykumar, Social worker Telem Arun and Publisher of Imphal Free Press Sietyajit were honoured by presenting gifts and mementos. Editor of this newspaper Rinku Khumukcham, President of MPPDU N. Meghachandra Meitei, President in charge of Socialist Students’ Union Manipur Soraijam Yaima Meetei Secretary of Socialist Women Association Sarungbam Bijayanty and Secretary of PoFM Lalita Chanu attended the observance as presidium members. IMPACT TV News Editor Raj Nongthongbam while speaking on the occasion expressed his gratitude in recognizing his service by MPPDU. “This is perhaps the first time I am being honoured with an award without applying”, Raj said and added that he had many time applied for award at DIPR but was never selected and he realized why one should applied for award, it is the authority that should select by recognizing the service. Raj Nongthombam, who also anchored many discussion programme at IMPACT TV said that his argument and presentation were many times criticized by some people saying that I am supporting some group or political parties. “During Congress Regime I did a programe Called Leikaigi Wakat and that was the voice of the people , when BJP come I asked question which the people want to know and not under pressure from anybody”, Raj added. “Presenting the Voice of the people is the duty of a journalist and I am doing my work”, Raj said. Telem Arun interpreted revolution as bringing change towards development . He narrated how he had help change a Village called Nongpok Sekmai- A village resided by around 120 family. If we work together we can bring change. Arun had indeed changed the village into a model village. As for Wahengbam Joykumar, he advocates people to stand up for justice. He said people should not remain quite for the injustice they had met. Imphal Times Editor Rinku Khumukcham and MPPDU President Meghachandra talks on the October revolution and its relevance to the present day Manipur society. With just one day to go to celebrate Ningol Chakkouba, Imphalites today witnessed Khwairamband Keithel – one of the most crowded Market today with thousands of parents, brothers thronging for buying gifts and the best edible items for their daughters and sisters who had left and start a new life with their in-laws. Starting from Maharani Bridge at Nagamapal towards Khwairamband Keithel till Rupmahal Theatre hall in BT road not even a single space was seen as almost all the area was crowded by people. Traffic police faced hard time in controlling the peoples’ movement and vehicles were diverted for conveniences of the pedestrian customers. One interesting scene witness today is the empty space at all the first floors of the Three Khwairamband Keithel. Some time passers- perhaps community who did not celebrate Ningol Chakkouba were seen hanging on the second floor of the three market building watching the crowd. Some lady vendor even were seen above the drain as they found no place to sell their goods. Those hoping to get some profit from selling the goods today and those coming to buy for their daughters and sister face lot of inconveniences not Photo by Sh Ajit because there is no place for them, but because the vendor ladies were not allowed to use the empty space of the first floor of the three Ima Keithel . “This is the only festival that I can enjoy a tasty meal together with my sisters and this is the only moment that I can buy something for my sister who had started a new life,” Khangembam Bonbir said while his wife Babita was carrying a set of handloom made Phanek and ennaphi. “Now I am looking for a tasty fish and some banana, coconuts and fruit for my wife Babita, for taking it to her parental home,” Bonbir said. Ukhrul,Nov.7: The Nehru Yuva Kendra, Ukhrul organized the District Level Declamation Contest in the topic “Patriotism & Nation Building” on the 6th November, 2018 at Oriental Naga Academy, Harkui Kathi, Ukhrul. The District Level Declamation Contest was Participated by selected youths from all the 7 Block of Ukhrul District. Many youth clubs from various villages in Ukhrul district actively participated and requested Programme Coordinator for conducting such more programmes in the district. T. Sanatomba Singh, District Programme Coordinator, Nehru Yuva Kendra, Ukhrul stressed the importance of organising Declamation Contest in the district to strengthen the spirit of Nationalism and Patriotism amongst youths. Master. Linus Lungleng of Tallui Reisang Youth Club from LM Block, Ukhrul won the 1st Position in the contest today, MISS. Paudoyile Solomu of Greenland Youth Club from Ukhrul Block and Miss. Sothingnao Rimai of ltham Youth Club from Kasom BIock, Ukhrul begged the 2nd and 3rd Position respectively. Silchar,Nov.7, The All Assam Manipuri Students Union, AAMSU inaugurated Anti drug campaign on this Tuesday here at Banskandi Junior College hall at Karaikandi in Cachar, Assam. The inaugural event was attended by AAMSU president Pangabam Nilkanta as functional president while Sarat Sharma, Advisor CADA, Ahongsangbam Irabot, senior advocate, Lamabam Romen, president ,Jiri Development Organization , JDO , Konthoujam Manganjaw, former Vice P r e s i d e n t , A AMSU , Lairikyengbam Thoiba, Social worker, Laishram Birkumar,Advisor AAMSU and Thongam Babahan , President Governing body, Banskadi Junior College as presidium members . Amongst other, Keisham Bidyapati, president ,Manipuri Literary Forum, Assam, Seram Herajit,former president AAMSU and president, Manipuri Youths Front Assam, MYFA and Former AAMSU Vice President Fanjowbam Lokenath were spoke as speakers. Sangit Ningombam, general secretary of the AAMSU while delivering key note address mentioned that the Manipuri society of Assam is now suffering from dangerous disease called “drug abuse”. If the prevention measure is not taken than the community will devastated one day, he further maintained. He also said that from this day onwards AAMSU will lodge a series of anti drug camping in each and every parts of Manipuri inhabitants areas of Assam. The event was also consisted of poster campaigns lodged. The event was attended by students and Youths and members of AAMSU hailing from different parts of the region. The advancement in information technology has made today’s world a ‘Global village’ – the term first coined by Canadian-born author Marshall McLuhan. Man born at the extreme corner of Far East Asiatic countries knows, cry and pray for the kind of disasters that happen in Middle East countries or in Latin America. Installation of internet technologies to cell phones which every human being can afford makes the people of our Earthwhose circumference is estimated at about 40,075 Kilometer staying at a communicable distance. Now every human being equipped with cell phone can now talk or stay in touch with any of their friends or relatives staying thousand miles away. Point bringing here is about the changes in the theory of mass media in relevance to today’s journalism. The very concept at which the older generation considered ‘proximity’ as a characteristic of news is somewhat losing its foot. Professor M.L Stein, the then chairman of Department of Journalism, California State University, Long Beach, Carlifornia in his book “Shaping the News” in 1974 wrote that people are mor e interested in what happens i n their neighbours. The one time presumption that ‘a dog fight on Main Street is of more interest to our readers then fifty thousand foreign troops killed in battle somewhere’ seems to have no relevance in today’s society. Readers are now interested about happenings at distance places if the subject matters is his or her interest. However, another characteristic of news - ‘Prominence’ on the hand is becoming a matter of more interested subjects for almost all readers. People now want to know what had happen to their leaders, celebrity or the bureaucrats irrespective of where they stay or which country they reside. Every news readers are eager to know the story of successful personality. Points bringing up here are not to lecture on what is news and what should be reported but this is an attempt to make some of our critic to understand on why the newspaper especially the kind of ours often published story about real heroes or events that happen far far away from our state. 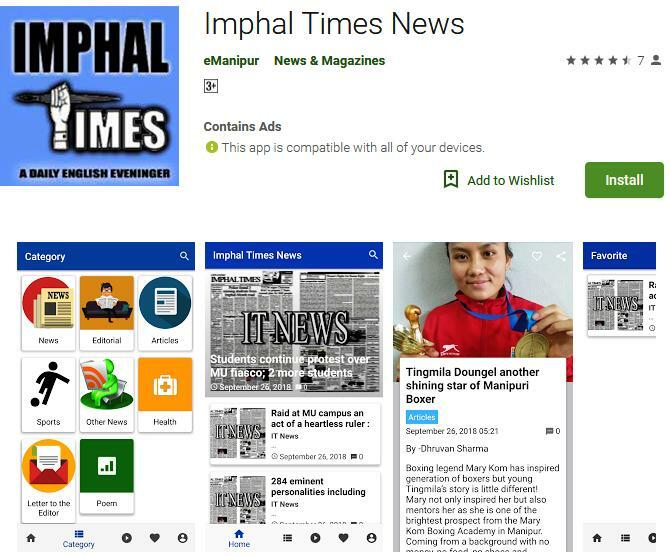 Sometimes a mere insignificant event at which some people are of vested interested are often left of and the result is not always good for we in the media fraternity of Manipur state in particular. The other kind of pressure that the media persons sometimes remain helpless is their intentions to get publish their story. Manipur or say Imphal is not a safe place for even VIPs who are escorted by security personnel days and night. It is an open secret that almost all the politicians including MLAs or Ministers or even the Chief Ministers have linked with the UGs , the only thing we don’t have is the proof. So, what would be the security of those working with the media if in case, some of the individuals or rebels force us to publish stories of their interest. Being taken up this profession, we always stand with our ethics and there is no question of compromising ethics while publishing stories. But when the government said that this should not be published and this should be published then where is the freedom of speech provided under the constitution of our country. Government machineries can invite news editors and can discussed about the content on objectivity reason but dictate the media. Calls of bandh or blockade by any organisation are in some way an essential news items for media houses living in conflict zone – because it is for the safety and security of the common people that the government machineries cannot guarantee their safety. We have PCI guidelines, local code of conduct and this should be respected. Bottom line is that media should not be harassed at any cost for any reason because we chose this profession not merely to earn for living but with full intention to serve our nation. On August 14 midnight of 1947 Manipur got its independence from British rule, and an interim government led by Maharajkumar Priyobarta was established. Even before the Assembly elections were held and a people’s government was set up, the Communist party and Socialist party were formed in Manipur. Unfortunately the Manipuri people failed to taste the sweet flavor of a free people’s rule in the land; before the taste could even reach the tongue’s tip, on October 15, 1949, a merger agreement was signed and the land too was forcibly joined to the Indian union. In 1952 the land was recognized as a Part C State - one of the lowest categories within the Indian union. Meanwhile, a few Congress and Socialist politicians with revolutionary zeal and ideals came together to form an organization called the Revolutionary Nationalist Party of Manipur and on April 19, 1953, at 3 pm in the afternoon, made the declaration at Kangjeibung that ‘Manipur is an independent nation.’ [Yendrembam Randhirkumar & RK Jitendra, eds., 2016: 88] This was an important event in the nationalistic movement in Manipur. Not long after, several acts of the Indian Parliament, such as National Security Act (NSA, 1980) Armed Forces Special Powers Act (1958, AFSPA), Terrorist and Disruptive Activities (Prevention) Act (TADA), 1985 etc., were passed and attempts were made at suppressing the armed insurrections. On the other hand, to protect the existing indigenous identity, boundary and freedom, a strong armed revolution with its foundations based on nationalism arose. In 1952 the Meitei State Committee took up an armed propaganda, and initiated an armed revolution. In 1964 the hitherto existing Revolutionary Committee came to be known as United National Liberation Front (UNLF) and also entered into an armed conflict movement. Truly speaking, the two decades of 1970s and 1980s was a period in Manipuri society when the emerging youth were equally engaged in both underground and overground warfare, thereby building up on the already existing wave of nationalism. In these two decades, on the one hand were the armed youths engaged in different forms of warfare, on the other were hundreds of students coming out publicly to address different social issues. The first students’ group of the state, the All Manipur Students Union (AMSU) in 1965, was formed by the numerous students who had participated in the agitation against famine in 1964. The Pan Manipur Youth League (PAMYL) formed in 1968 was also an organization comprising the energetic youths of the land. Though its mouthpiece publication, ‘Lamyanba’ edited by NK Sanajaoba, one of its pioneering leaders, the league strove to inspire the students of the time through its varied writings. Thus, there clearly existed a strong nationalism and an armed conflict movement triggered by it in Manipuri society. An attempt to view literature within the context of this movement is a very political approach. During the early part of the 20th Century, also regarded as the Renaissance period of Manipuri literature, the awakening of Modern Manipuri literature was heralded. During this period which is known in the history of Manipuri Poetry as the period of Chaoba-Kamal, they started humming a sweet song of Patriotism, eulogizing their mother language and the motherland, for a new awakening of their native literature. However, a fully mature political consciousness was yet to be seen in their writings. On the other hand, in the poems of Jananeta Hijam Irawat, who was more or less their contemporary, this concept was vividly expressed. Therefore it is without contention that in the journey of Manipuri literature, Irawat was a poet in whose poetry a nationalistic ideology accompanied by a concrete political consciousness is present. But unfortunately even though there is recognition of his contribution to the nationalistic movement in Manipur during the early part of the 20th Century, he was yet to be recognized as a poet. This despite his varied publications including ‘Seidam Sheireng’, a book of poems published in 1929 for students, and his masterpiece poetry collection ‘Imagi Puja’ written during his imprisonment in Sylhet Jail (1942-43) and published much later in 1987. An important reason behind the estrangement of Irawat by the Manipuri society could be his political stance against the all powerful Manipuri King and British Government. The charges of treason against Irawat by the Manipur government, his imprisonment from 1940 to 1943 and subsequent exile, his initiation into the communist fold, the 1948’s Pungdongbam’s incident and his subsequent underground status, the announcement of a reward on his head which put him on the ‘wanted’ list – all these became important reasons why the Manipuri society of that time did not want to openly support him or talk of him. The imprisonment of Irawat’s former colleagues, sixteen of them, in the Conspiracy Case of 1951, made even the mention of the word ‘Communist’ strike fear, thereby making the Manipuri society distance themselves further from Irawat. Flying close towards the sun. Sighting the seven colours of the past. Returned to the previous habit. The poets of this period minutely discussed the Manipuri culture, oral literature, creation myths, and stories of god and goddesses and entered into post-colonial writings. Their efforts to develop a poetic style unique to this land and born out of the soil, the fertility and the creativity of this land, and also their attempts to give it a universal appeal, is based on the ideology of Manipur nationalism. In their poetry is explicitly expressed their journey of inner self-discovery and their realizations of a unique ethos and identity of the Manipuri nation. The poets of this period frequently expressed a unique image of the ‘Manipuri-ness’ of the nation - found in its creation and cosmological myths, in its arts, culture, language, religion and aesthetic values – along with a political tone in their poetry. Even in this present period with its abundant publishing of poetry, the heart and soul of these poems is the nationalism of this land and the armed conflict triggered by this nationalism. Therefore, in order to view the core issue and an ideological positive response to the nationalism and armed conflict in Manipuri poetry, we have to study the poetry of this time. Stand up, if not in chains. Laughing with the other flowers, together. Even though, generations of Manipuri poets wrote poems related to Manipuri nationalism and armed conflict, it is hard to find committed poets like those who emerged together during the 1980s to write with a consistency and seriousness on this issue. In their poetry, these poets who emerged in episodes, were more concerned with tangential issues and fragmented ideas and painting the overall negative impact – for example, peripheral problems unrelated to ideology of armed conflict such as the problems caused by those using the revolutionary movement for their vested interests, moral degradation, extortion, the in-fighting between the many mushrooming factions, the loss of trust of the people, freedom as lip-service, the attitude of the armed revolutionaries who are now interfering in issues of localities, etc. On the other hand, these are important problems that Manipuri literature and the present society both are facing. If a solution to this is not searched out at the earliest, it will be a dark blot on the history of the nationalism and armed conflict in this land. At present the nationalistic movement and its accompanying armed conflict continues in this land. But till date, very few poets have been able to write with the same poetical insight which was there in the 1980s poets, who still continue to build up the image of nationalism and related armed conflict.